Suppose you have following file with hello.js which you want to include. Use following syntax to include hello.js? console.log(helloFileObj.hello()); //It would print Hello, How are you? Question: What's the difference between tilde(~) and caret(^) in package.json? the tilde(~) matches the most recent minor version. For Example ~1.4.3 will match all 1.4.x versions but will miss 1.5.0. Benefits: Gives you bug fix releases. the caret(^) matches the most recent major version. Benefits: Gives you bug fixes including new functionalities. Question: How do I pass command line arguments? Here one, two=222 and three are command line arguments (1,2,3 respectively). Question: How to access 2nd argument when passed in command line? Question: How to list the packages? Question: How to exit from node Code? Question: How to generate Secure random token Node.js? For this you can use crypto module in nodeJS. Question: How to output pretty html in Express? Question: How to clean node_modules folder of packages that are not in package.json? Question: How to format a date string in UTC Format? Question: How to get client IP Address in Node JS? Question: How to force strict mode in node? Write below code at the top of node file with enclosed with double quote. Question: What is promises in node js? We use the promises for asynchronous operation and it have following 3 states. Promise contain two parameter i.e. resolve(for success), reject(for failed). Yargs helps to parsing arguments of command line tools. Question: How to install Yargs module in node? Question: Give example of Yargs module? 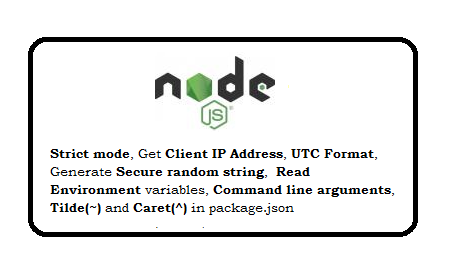 node test.js --name="Arun" --age="28" --city="Chandigarh"
How to create an HTTPS server in Node.js?. Send Acknowledgment for socket.io event. node js underscore tutorial with examples. Express JS Interview Questions and Answer for 1 Year Experienced. Express JS Interview Questions and Answer for experienced. Mongoose iterate records over results using async module. Node Js Interview Questions and answer for Experienced. Emoji / Emotions icons integration in CHAT. Express Js routing example - GET/POST/PUT. NodeJS - call a method after another method is fully executed. How to upload file/images using nodejs?. What is a promise and how to use with mongoose?. Express JS - use res.sendFile - use EJS template - Set and Get Session data. Socket.IO module with nodeJs tutorial. underscore module with nodeJs tutorial.